Chennai, April 17: Call it an elections effect or a sudden surge in the number of drunkards, the sale of alcohol in Tamil Nadu reached Rs 500 crore in just three days, said Tamil Nadu State Marketing Limited Corporation (TASMAC) on Tuesday. The TAMSAC is of the opinion that this surge might indicate a large amount of alcohol had reached voters during the campaign trails. According to the reports, as published by the New Indian Express, the sale of alcohol on Saturday in Tamil Nadu was over Rs 140 crore and it was over Rs 160 crore on Sunday. TASMAC has stated that this might be due to the election commission mandating closure of outlets from Tuesday and political parties waited till the last moment to stock up on alcohol for distribution on poll day. Dry Days During Elections 2019: Alcohol Sale Banned Till April 9-11 in Constituencies & States Being Contested in Lok Sabha Polls Phase 1; Check Full List. 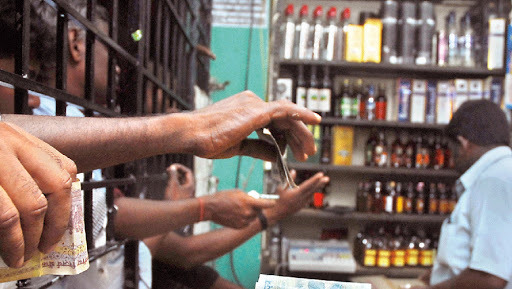 Briefing more, president of TASMAC employees association affiliated with the AITUC, N Periyasami, said, "This time, the sale of alcohol before the polls are unusually high. Alcohol has always been associated with the polls but the extent to which it has come to, is worrying." He further stated that the absence of speeches proposing complete prohibition by political parties as one of the main reasons behind the increase in alcohol sales. Adding on he said, as the daily quotes, the sales have increased not because of quantity but because of the quality of alcohol that is being procured for distribution.